The excitement around here is becoming hard to handle! No, really…I love all those things and they’re all happening at the moment. Maybe excitement is too strong a term, and it’s difficult to really fit enough of them all in, what all the full-time working, but still…they make a happy me! Starting with a catch-up from last week then, on Saturday night we went out for a belated anniversary dinner. We went to Fratello’s, an Italian restaurant which we have only been to once before, but which we are already coming to love. We each had 3 courses, which is a rarity, and it was all good. I was in serious pain for some time afterwards – I know I cannot eat big meals without suffering, but sometimes I’d rather stuff my face and suffer for it! 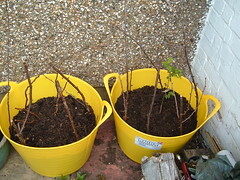 On the left is a newly-potted raspberry cane, a birthday present from my friend Mrs Jarge. 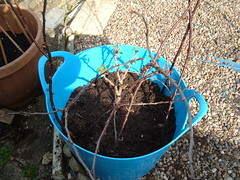 This gooseberry bush came from the same source – it already has new leaves since I planted it on Sunday! I also planted some herbs, from seed. If you look closely at the pot on the left, there are three tiny little seedlings just popping up. 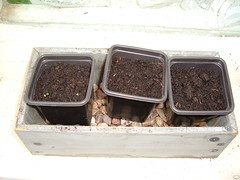 There is another tray like this, with more herbs, and A planted some tomato seeds into a propagator tray, and spring onions and radishes outside in another big pot. 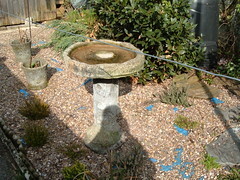 Finally, we managed to retrieve my Nan’s bird bath, which had become very overgrown behind the cherry tree and climbing rose. There’s lots more still to do. The gravel needs topping up, as the blue sheeting is visible through it in places. There are more pots to be filled, once we get more compost. 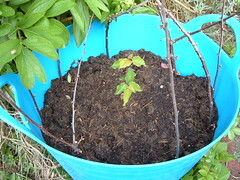 We need at least one more massive pot, to grow potatoes in (they are chitting at the moment – isn’t that a great word)? And we have lots of packets of flower mix aimed at attracting bees. We get lots of bees anyway, but they are lovely to see and hear buzzing around, so why not feed a few more? 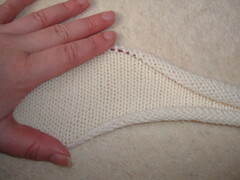 Moving on, I started knitting the shrug I want to take away in the summer. I’ve made some progress, but I’m torn between knitting and cross-stitch at the moment, and thoroughly enjoying both. I’ve been doing both in the evening, while watching snooker, but whichever I pick up first I end up keeping in my hands, however carefully I plan to switch. There’s not much to see really, but it’s very soft and pretty. Again, not much to see so far. Maybe I’d make more progress if I worked on one or the other?! In work news, the anxiety of change is back. We’re just settling into our new organisation, only this week a new manager’s post has been advertised. It’s equivalent to the boss-man’s job, only no-one seems to know whether the team will be split between the 2 managers, how the work will be divided up, or how it will work. Almost everyone in the team has decided to apply, which could make things uncomfortable. I can’t make up my mind whether to go for it or not. It’s a lot of extra responsibility, and likely to involve more travel, including more regular days in Bristol and visits to National Office in Coventry. It is a lot more money, and the work I’m doing can be repetitive and dull – I could do with a challenge. I’m not particularly healthy or reliable though, and the director appointing the post knows that. Plus, interviews are really stressful. But if I don’t go for it, I won’t even be trying to have an impact on the coming changes, which will happen to me anyway. And it’s good to go for interviews from time to time, to keep in practice and minimise nerves. I dunno, but I have to make a decision very soon. It’s a stress I could have happily lived without. Anyway, this week there’s more snooker. This afternoon we’re going for a picnic at Coate Water with Mrs Jarge. On Monday I have the day off work, to take some flowers to Oxford Crematorium for my Nan’s birthday. A’s Mum is coming along for the day out, and we’ll probably stop off at Millet’s Farm (pick your own, farm shop, garden centre, petting farm, restaurant and more) on the way back. Then on Weds lunchtime I’m meeting Caron for lunch, and it’s our niece Morgan’s birthday. And next Saturday we’ve offered to have Morgan and her sister Madison round for a while. Busy, busy! Anyway, I’m missing the snooker while writing this monster of a post – gotta go! 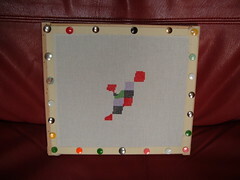 This entry was posted on April 24, 2010 at 10:31 am and is filed under Cross-Stitch, Food, Home, knitting, Work. You can follow any responses to this entry through the RSS 2.0 feed. You can leave a response, or trackback from your own site.